“Keep up that fight, bring it to your schools. You don’t have to be indoctrinated by these loser teachers that are trying to sell you on socialism from birth. You don’t have to do it.” —Donald Trump Jr.
“I am a loser teacher. When I get to school, I start my day trying to figure out what my kids need from me. This one needs encouragement. That one needs extra time to finish the essay. This one needs love. That one needs advice.” said Kondro in a post on Facebook. 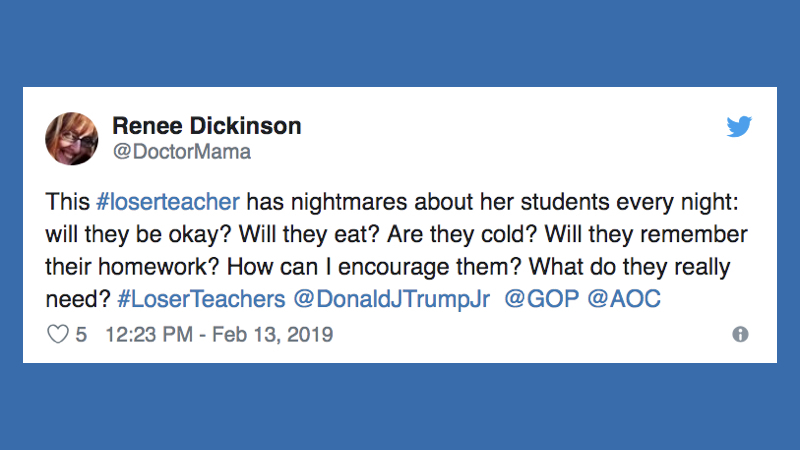 Kondro wasn’t the only one to share what it is like to be a “loser teacher.” #LoserTeacher trended on Twitter, with a flood of educators and advocates defending the work of teachers. Teachers like Annie Burge talked about what keeps “loser teachers” busy all day, like practicing tornado drills, encouraging reading, and grading 48 tests before dinner. While other teachers, like Andrea Thomas, talked about teaching students how to seek reliable facts and form their own opinions. As a #loserteacher I promise to continue teaching my students to question what others say and write, look for reliable evidence and support as the foundation for any argument, and be weary of those who insult the opposition in attempt to discredit them. Teacher advocates showed their solidarity and support as well. What’s your take on Trump Jr.’s “loser teacher” comment? Come and share in our WeAreTeachers Chat Group on Facebook.